MGM mounted this colorful adaptation of Sir Walter Scott's tale of a noble Saxon knight trying to restore the throne of England to King Richard, who has been kidnapped by his brother Prince John. This popular, trendsetting film earned a Best Picture nomination and fueled other 1950s medieval actions films. The impressive action scenes include a thrilling jousting tournament, a large-scale assault on a castle, and a brutal climatic duel in which Robert Taylor and George Sanders whale on each other with axe and mace, respectively. Elizabeth Taylor and George Sanders. But what separates Ivanhoe from its peers is its low-key realism: Ivanhoe may be a nobleman, but he can't read; Ivanhoe's father is a kindly lord, but his servants still wear metal collars; and Elizabeth Taylor's Rebecca is shunned by Saxons and Normans alike because she is a Jew. The cast is in fine form, except for Joan Fontaine--she brings no fire to her character, leaving one to wonder why Ivanhoe prefers her over the intelligent, gorgeous Rebecca. Sanders provides surprising depth to his villain, whose lust--and eventual love--for Rebecca causes him much internal conflict. Emlyn Williams, who gives a delightful performance as a servant-turned-knight's squire, was also a successful playwright with stage hits such as Night Must Fall. Robert Taylor and director Richard Thorpe teamed up for two other 1950s costume dramas, Knights of the Round Table (1953) and Quentin Durward (1955), also based on a Scott novel. The latter is the more entertaining of the two and features a nifty swordfight with the opponents swinging on ropes in a burning bell tower. Anthony Andrews played Ivanhoe in an above-average 1982 made-for-TV movie. Tony Curtis and Janet Leigh. This modestly-budgeted, by-the-numbers swashbuckler was clearly intended as a training ground for rising stars Tony Curtis and Janet Leigh (appearing in the second of their six films together). The radiant Leigh, draped in stunning gowns, is clearly more at home than Curtis. He struts around in tights like he was getting ready for a Brooklyn rumble. Still, he gets ample opportunity to display his athletic prowess and, considering that the film's hero is a hothead, his vigorous performance ultimately gets a passing grade. 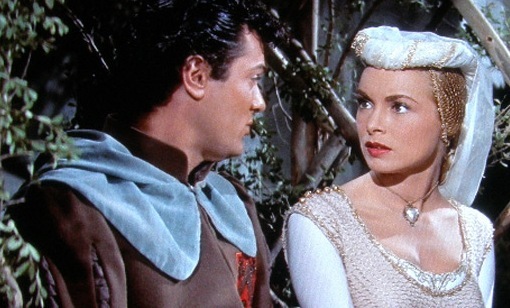 Set in England during the reign of Henry IV, the plot follows Myles (Curtis) and Meg (Barbara Rush), two peasant orphans who don't know that their noble father was unjustly branded a traitor. The local vicar sends them to live in the castle of the Earl of Mackworth, with Meg to attend the earl's daughter Lady Anne (Leigh) and Curtis to be trained as a squire. Once Mackworth realizes Myle's true identity, he hatches a plot to use him to defeat the evil Earl of Alban--who is plotting to overthrow the king and also happens to have been responsible for the death of Myle's father. David Farrar (right) as the villain. The Black Shield of Falworth gets a huge boost from an outstanding supporting cast: Herbert Marshall as the fatherly Mackworth; Dan O'Herlihy as Prince Hal, who plays the fool to deceive the bad guys; David Farrar as the villainous Alban (decked out in black from head to toe); and Torin Thatcher as the eye-patched, staff-wielding taskmaster that transforms Myles into a valiant warrior. One wishes that these fine performers received more screen time, but their presence is reason enough to spend 99 minutes with The Black Shield of Falworth. Plus, at the risk of sounding shallow, the two leads are easy on the eyes. Nice pairing, Rick. Like you, I felt that Fontaine's performance in "Ivanhoe" was so flat, and Taylor's so enchanting, I thought Ivanhoe was blind as a bat. But then, the realism of which you speak comes through here too -- no man of his class and rank would ever consider anything serious with a Jewish woman in that era. The "Black Shield of Falworth" was a lot of fun to watch. To me, the supporting case was certainly better than the main characters, who were young and pretty, but not much else. One of my favorite movie reviews, read a long time ago, always makes me laugh ... Curtis with his strong New York accent saying "Yonda lies da castle of my fadda." A little exaggeration, but funny! Fun and interesting post, Rick. The first time I saw "Ivanhoe" I was surprised at how the film's plot is basically the same as "The Adventures of Robin Hood". I think the Robin Hood screenwriters used the Sir Walter Scott as an inspiration. "Ivanhoe" may not be as much fun as the Flynn film, but it is very satisfying in its own way. I will happily beat the Robert Taylor drum as long and as loud as possible. He gets a lot of grief from a lot of movie fans, but I've always liked him. Kevin, I am a Robert Taylor fan, too. He's quite good in IVANHOE and even better in QUENTIN DURWARD. I agree, guys. I always liked him in Bataan, Three Comrades and Quo Vadis. And then there are Waterloo Bridge and Camille. And .... well, you get the picture! LOL! The Lady Rowena, Joan Fontaine's part, is played as written by Walter Scott. In fact books have been written about the two heroines and they are well worth reading. Think Mark Twain got in on this. Sorry, it is Thackery not Twain. Rebecca and Rowena. You would also love Robert Taylor in another Walter Scott story: QUENTIN DURWARD in 1955, for me the high point of MGM's great 50s costume films. He is wonderful as the ageing knight and Kay Kendall is ideal as the Countess he falls in love with. It has wit, drama, swashbucking, romance and a great supporting cast headed by Robert Morley as the devious French king. It was filmed too in Europe at a lot of french chateaus. I also like 1955's MOONFLEET from a book I love, the film is much changed but is a great period romp with Stewart Granger and George Sanders and Joan Greenwood as ideal villains. Though it was filmed in California is captures that 18th century pirates genre perfectly. I had a fantastic librarian in 5th grade who read us a shortened version of the book. Then she showed us Taylor's movie. I loved the way she read us the story and never forgot the movie. She inspired me to read the classic in high school. My father bought the movie for me. It has great battle and action scenes. As for Joan Fontaine, I think her performance was excellent. She played Rowena just as Scott wrote about her in the book. The story wasn't about which woman Ivanhoe would choose but doing the right thing by saving Rebecca's life. As for my librarian, she made the book come alive for her students by the way she read it and showed the movie. I'll never forget her. Rick, I thoroughly enjoyed reading about this swashbuckler double feature! When I read your post about "Ivanhoe" I couldn't help but notice that Joan Fontaine seems to have a hard time opposite characters named Rebecca. I loved the photos you posted of both Elizabeth Taylor and Janet Leigh. What gorgeous women they both were. I love a good film filled with derring-do and you have provided a pair of them. Well done! Toto, I had to jump in here, still laughing, and tell you how clever you were to make that connection with Joan Fontaine and Rebeccas! LOLOL! My secret, tragic hero always was George Sanders! I only know the german version, but wenn he speaks to Rebecca, just befor the trial by combat, this always moved me and I hoped she would consider his love ... then he says: "Ich wäre nur ein gefallener Ritter, aber für Deine Liebe würde ich all das ertragen". like somebody on the forum commented: This "deepth" of the villains role always set the movie aside for me. Not so many stereotypes. Great quote! I agree that Sanders' performance is one of the film's strengths. Yes Brian/Sanders is the real hero. Also, the first scene of the movie is taken from "The Song of Blondel" where the troubadour Blondel searches for king Richard and locates him in the Austrian prison/castle. Scott's real story is behind the scenes of all the action.